Stankovytch, a Ukrainian pupil of Boris Lyatoshinsky (whose own symphonies are also available on Marco Polo and on Russian Disc) is given high praise in David Fanning's marvellous survey of Russian symphonists (Gramophone December 1996). You can hear his Symphony of Pastorals and Chamber Symphony No. 2 on Consonance - if you can find it. The First Symphony is for fifteen strings. These are not ideally rich (although perhaps the composer intended a somewhat starved string tone). The clarity of the small ensemble somehow exacerbates the haunted atmosphere overcast with presentiments of upheaval, shrieks of atonality (Penderecki Hiroshima Threnody?) and Bartokian chiittering from the violins. The music seems to conjure up some expressionist dream with Klimt-like figures writhing slowly in distorted agony. The Second Symphony is a protest against war. Think of Andrzej Panufnik's Tragic Overture - striving and strident, the smoke and mist mingle, the brass kick and call, rasping and collapsing. 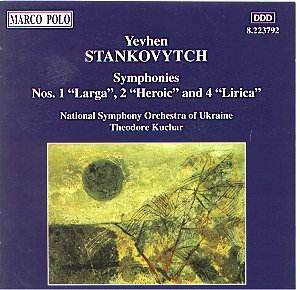 Stankovytch may also have been influenced by Shostakovich Symphony No. 6. The second movement's hollow awe (Alwyn's Hydriotaphia) is succeeded by a very short moderato returning to the atmosphere of the first movement. The Lirica is seemingly influenced by Valentin Silvestrov's Symphony No. 5. It is scored for a much smaller band: sixteen strings plus solo cello. The notes tell us that the music seeks 'the natural essence of spiritual beauty'. It does so with some of the drenched succulence of Silvestrov but it does not have that symphony' communicative eloquence. Still, if you think of a giant single span of 26 mins of Melachrino, Mantovani or Semprini wrung by the forces of atonality you will gain some impression of the sounds to be heard. Very good notes by the conductor and by Andriy Kochur. How many more symphonies has the composer written since this disc was issued? I did not find this music compelling although, clearly, Stankovytch's voice is one of character and intensity. I, for one, will want to hear future discs as and when they are issued.